Whether your job requires it or you’re just trying to be extra safe, using the best steel toe work boots is just a smart thing to do. If you want to make sure you’re protected, you’re in the right place. We researched a lot of the best-selling, top-rated options available and put together this review to help you find the right boots for you. Before we get started, let’s take a look at some of the key things to remember. Material: All of these boots are made of either leather, nubuck leather, or suede. These materials may all have a different look to them, they’re all really durable and build to last a long time. Gender: Some of these are specifically marketed to women and come in colors like pink or purple, but don’t be fooled. 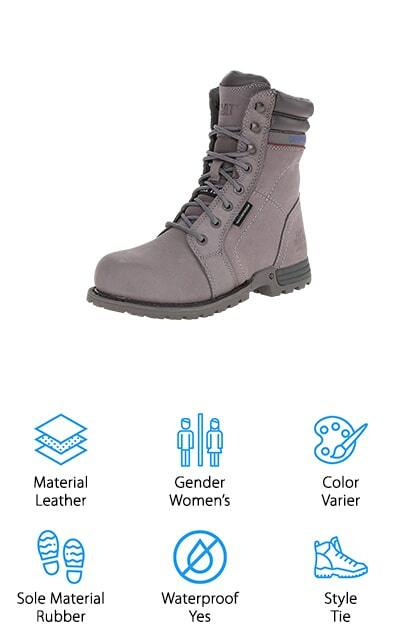 The women’s boots are just as durable as the men’s. They just have a bit more flair. Color: We already touched on this a bit but some of these boots come in pinks and purples in order to have a little more style. 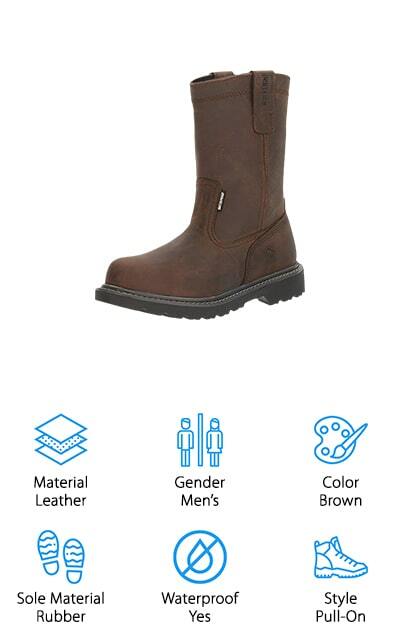 Most of the men’s boots come in pretty standard colors, like brown, black, and gray. Sole Material: Most of our top picks have rubber soles, though there are a few that are synthetic. Regardless, every single boot we chose for our reviews is slip resistant which is an important characteristic to have on a work boot. Waterproof: All of these boots offer some sort of water resistance, but there is a difference between that and being truly waterproof. If you work somewhere where your feet get wet a lot, waterproof is the way to go. Style: We found both pull-on and tie style boots in our research. Lace-up boots allow for a little more adjusting while slip-on boots aren’t always easy to get on. Neither is better than the other, this one pretty much boils down to personal preference. Now that you know what to look for, let’s move into our reviews. If you don’t have a lot of time, that’s okay! Just start at the beginning of our list with the top and budget picks to get a good idea of the range that’s out there. Stick around as long as you can, though. You never know what product will be the right one for you! So, what are the best steel toe work boots? Let's find out! Our top pick is the best-rated steel toe work boots we found on our research, the Caterpillar Echo Steel Toe Work Boot. The best part? These boots are made for the ladies. 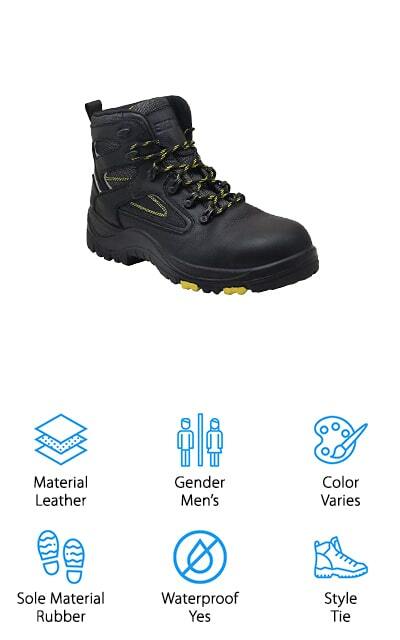 Caterpillar uses iTechnology construction to make these boots durable for the job site. They provide durability and protection and are so comfortable, they feel like an athletic shoe. Inside, they feature a breathable lining and sock liner as well as added shock absorption in the midsole to keep you comfortable on your feet, all day long. That’s not all, they keep you covered with a lot of protection, including waterproof uppers, electrical hazard protection, and a slip-resistant sole. The tall silhouette is stylish and they’re available in 2 eye-catching colors, frost gray and marlin, a dusty dark purple color. The best steel toe pull-on work boots we found in our research just so happen to be our budget pick, too. The Stanley Dredge Work Boot has a 100% full grain leather upper and Chelsea boot styling that looks good enough to wear off of the job site, too. In addition to the steel toe, these boots also have heel counters for even more protection and extended durability. Elastic side gores and large pull-on loops add interesting details and make these boots really easy to get on. Inside, you’ll find a moisture-wicking liner that helps keep your feet nice and dry on long days at work. There’s also a removable EVA insert and a steel shank for extra comfort and stability. One more thing, the rubber sole is slip and oil resistant. If you’re looking for the best steel toe work boots for flat feet, the Dr. Martens Icon Steel Toe Boot just might do the trick. Inside of these boots are the brands Air Wave midsoles. They’re soft and have just the right amount of cushion to provide both comfort and support. 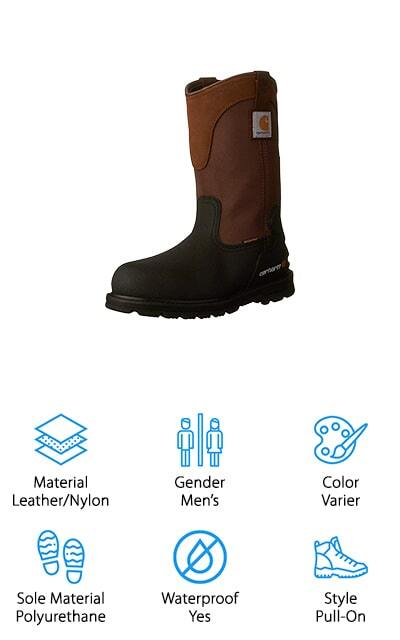 These pull-on boots have a shaft that’s about 12 inches high and 2 pull-tabs to help get them on quickly. They’re made of supple leather that’s comfortable, durable, and stylish. That’s not all, they also have a heat-sealed welted construction that will keep these boots working for a long time. The outsoles are slip and oil resistant and provide a lot of traction so they’re good on multiple terrains. One more thing, they’re both ANSI and OSHA approved for job site safety. One of the best steel toe boots for warehouse work is the KEEN Utility Detroit Work Boot. The uppers are made of nubuck leather and are available in 3 different colors: brindle, slate black, and gargoyle. They’re waterproof which means they’ll keep you dry in both rain and snow. Inside, they feature a dry-lex lining that’s waterproof and wicks away moisture while still being breathable to keep your foot comfortable all day. There’s also a removable EVA footbed that you can replace with inserts if you prefer. The midfoot features extra stability and support and the non-slip rubber sole is oil resistant and non-marking. It actually has some pretty aggressive tread which makes these a really versatile boot that can be worn outdoors, too. There's even reflective webbing on the outside for additional visibility and safety. The best steel toe work boots for concrete floors are the Workshire Work Boot from Sketchers. They feature a full grain leather upper with stitching and overlays for a rugged, stylish look that’s also waterproof. Inside, there’s a memory foam insole that provides support as well as superior comfort for long days walking around on the warehouse floor. That’s not all, the rubber outsole is grippy and oil resistant which makes this boot versatile enough to use on just about any terrain. Another great thing about them is that the laces actually stay tied when you tie them. 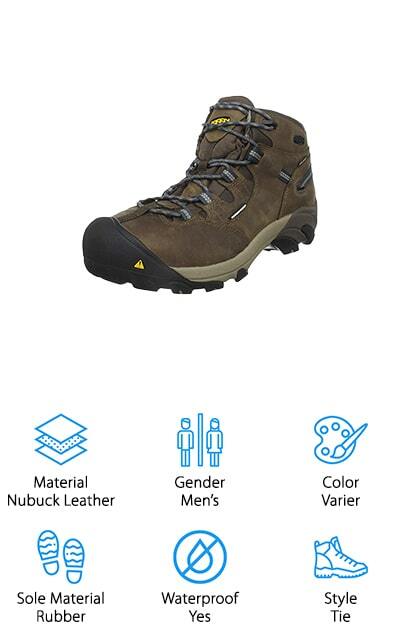 In addition to being comfortable and really durable, these boots are also surprisingly affordable as well. They’re available in a few different neutral colors, too. You can choose from black, brown, and dark brown. By far, the Carhartt Wellington Work Boot is the best winter work boots steel toe option. Why do we say that? Well, one of the main reasons is because these slip-on boots are insulated. They also have a breathable waterproof membrane to help keep your feet dry in rain, ice, or snow. That’s not all, the sweat-wicking liner and low-bulk insulation provide the perfect amount of warmth. This boot was built really tough. It has a reinforced body, impact resistant heel, and toe, and uses reinforced fabric lining for long lasting durability. The leather itself is oil-tanned and coated in polyurethane. Another great thing about these is the rubber sole. The aggressive and durable tread that hold firm when it’s slippery and are easy to clean even after getting caked in mud. Our next choice for the best steel toe work boots is this pair from Safety Girl. As you might have guessed from the name, these boots are made especially for women. 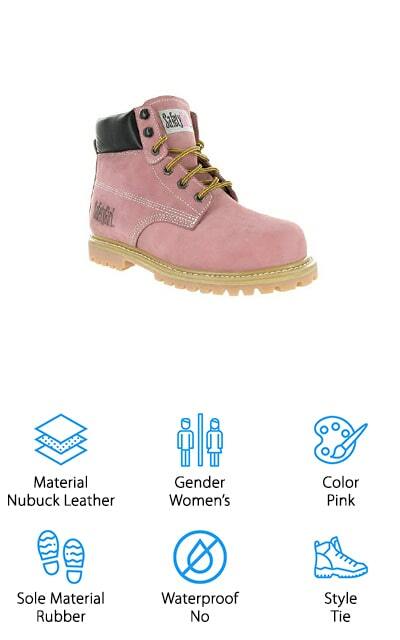 They may have a feminine pink color that these boots are tough. The nubuck upper is durable will last a long time. While these aren’t completely waterproof, they are water resistant and are great for most job sites. That’s not all, they also feature a double-color rubber outsole that’s oil and slip resistant and provides full traction on a variety of surfaces. The tread is pretty aggressive and suitable to a lot of different environments, too. These boots may have a girlish look to them but they’re definitely made tough enough that you’ll be able to do anything your coworkers can. 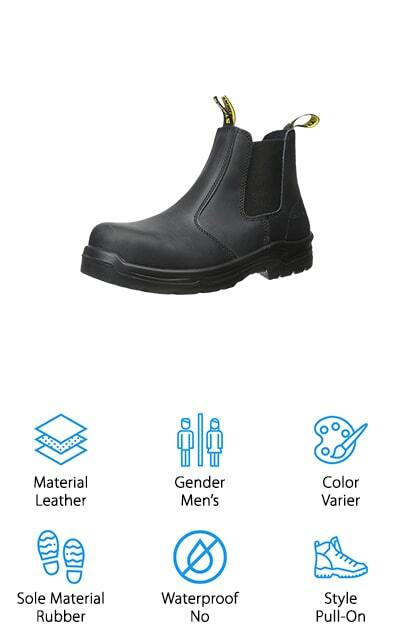 EVER BOOTS Protector Work Boots not only have a steel toe for safety, but they also feature a steel shank for added stability when walking on uneven surfaces. One of the most notable things about these boots is that they provide electrical hazard protection and have passed safety tests involving 18,000V. 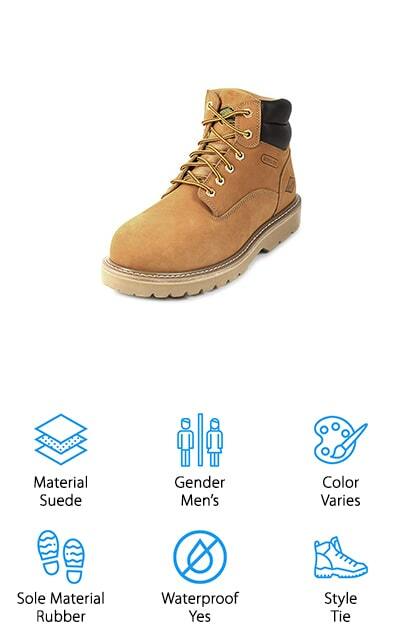 This makes them a particularly fitting choice for engineers, electricians, maintenance men, mechanics, or anyone who might come into contact with any electrical parts and equipment over the course of their workday. The rubber sole is slip and oil-resistant and provides a reliable grip on even slippery surfaces. As for comfort, these boots have a shock absorbing outsole that helps to take the pressure off of your arches. One more thing, these boots are also extremely affordable which makes them a good choice for anyone on a budget. A good choice for best comfortable steel toe work boots is this pair from Rockhard. 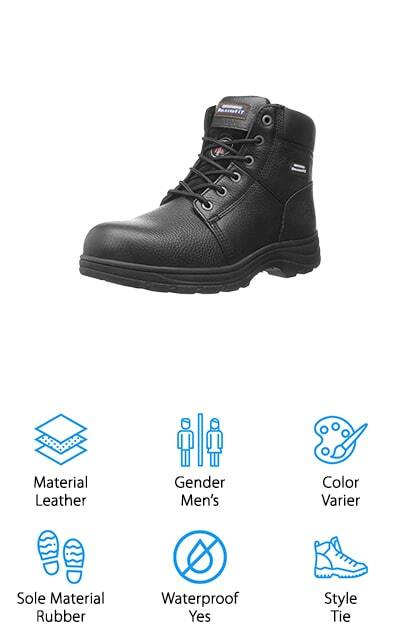 In addition to the protective steel toe cap, these boots also provide great ankle support. The shaft measures about 6-inches and the laces allow you to tighten the top as much as you want to get the support you need. Genuine nubuck leather uppers are super durable and the waterproof construction keeps your feet warm and dry in any kind of weather. Inside, there’s a memory foam footbed that provides the perfect balance of comfort and support. It’s removable, too, so if you have an insert you like to use, just slide it in and you’re ready to get to work. The rubber outsole is slip resistant, too. One more thing, these boots are also rated for electrical hazard protection. Last on our list is a great option for the best slip on steel toe work boots for women, the Wolverine Floorhand Work Boot. These boots feature a 100% leather upper that’s durable and waterproof. They feature a 10-inch shaft in a pull-on style. That’s not all, there are pull tabs on either side of the boot to help you get them on quickly and easily. The slip-resistant rubber sole has aggressive lugs that will keep you on your feet when working on any surface. These shoes are pretty lightweight which makes them really comfortable to wear all day. The footbed is fully cushioned for support and comfort but can be easily removed if necessary. Wolverine has been in business in 1883 and has really honed their skills over the years, something that shows in these boots.